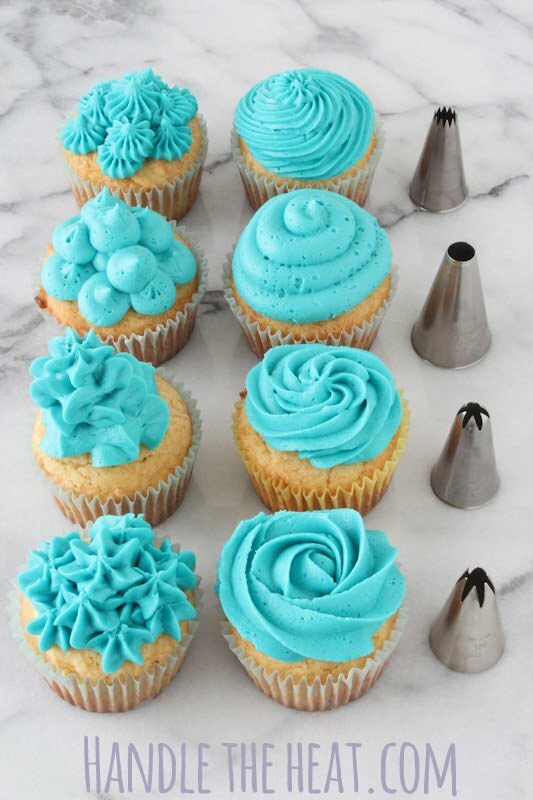 This quick video shows how different cupcake decorating tips make different designs with frosting. Come see which are my favorite tips for easy adorable cupcakes! Today’s post isn’t a recipe, instead it’s a quick video and tutorial about how to decorate cupcakes using piping tips! Every time I bring cupcakes to a gathering people always seem impressed by how the frosting is decorated but really, it couldn’t be easier. 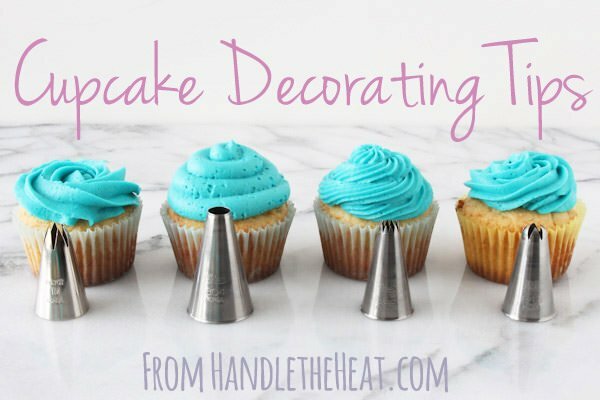 I wanted to share with you some of my favorite piping tips so you can see what kind of decorative effect they produce on cupcakes. 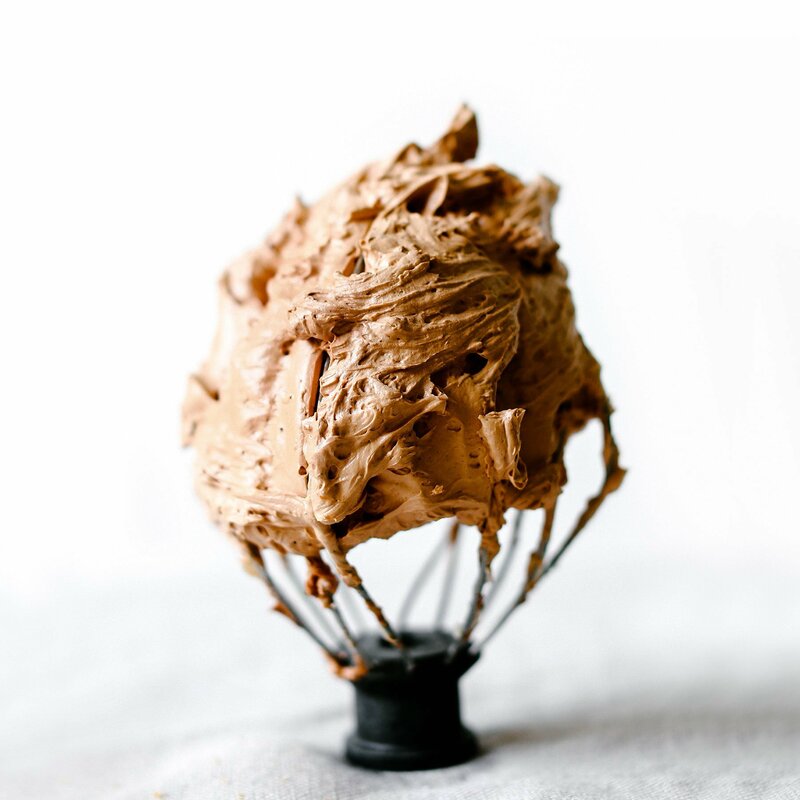 I’ve included Amazon links to various products that I’ve used at the very end of this post but you can also buy frosting and pastry supplies at stores like Michael’s and Hobby Lobby. Some grocery stores even have a fair amount of baking supplies. I used Wilton’s gel Icing Color in Sky Blue to dye the frosting to make it easier to see. I also used a disposable pastry bag and large coupler to change out the tips throughout the video (links to these products at the end of the post). 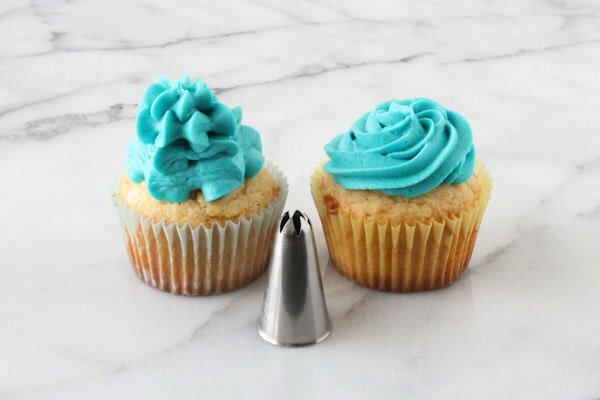 Whenever I’m experimenting with a new tip or decorating technique, I’ll take one cupcake to practice on, scraping the frosting off for a blank slate to re-frost. 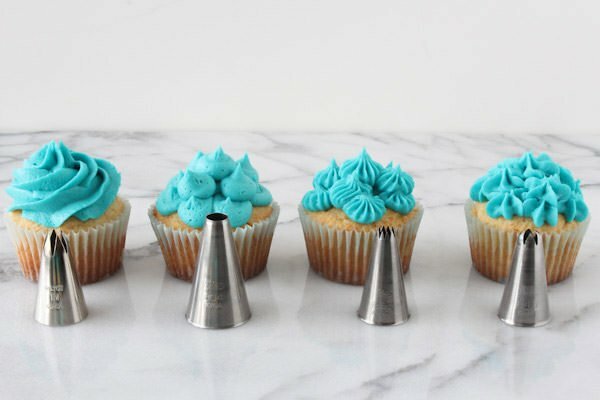 Watch the video to see exactly how to pipe frosting onto cupcakes using decorative tips! Check out all the pictures below to see how each pastry tip looks, what kind of frosting designs they make, and some comparison shots! 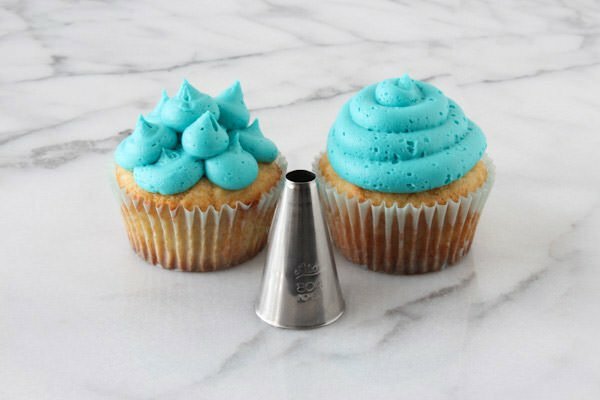 Ateco 843: This is a closed star decorating tip that’s perfect for making pretty swirls or tall bursts of frosting. Wilton 1M: This is an open star decorating tip. If you only buy one decorating tip, make sure this is the one! As you can see, it is extremely versatile in creating flower-like dollops, beautiful swirls, and even easy rose patterns. This tip is perfect for cupcakes but the rose patterns also look fantastic on cakes. Ateco 804: This is a really fun big plain tip that gives you perfect little kisses of frosting or big, luscious swirls. This one is super easy to use. awesome & informative post – but just FYI, when you talk in the video there’s no audio, besides the background music. Maybe it’s just the way it’s loading for me? I figured what I was doing in the video was pretty self-explanatory and there wasn’t much to say! Plus, I went through the different shots pretty fast so I don’t think I would have been able to talk that quickly anyways 😉 I just wanted this to be a short video so you could actually see how the cupcake piping tips work! Love this Tessa! You’ve got some great resources here. Can I just say, you are so organized and helpful Tessa! I’m doing a cupcake wedding this fall and am in the process of deciding on decorating. This is just the post to help me do it! Thank you, thank you! Awh thanks Caroline!! So glad this could be of some help to you. I did my dad’s wedding cake two years ago and relied heavily on helpful blog posts and it turned out pretty well! Ok such amazing tips and geez, you are so pretty! Your video is awesome and I am now so excited to go frost some cupcakes! YAY! Gorgeous cupcakes!! Great job on the video!! What a great tutorial! So many gorgeously frosted cupcakes! What the icing recipe?? Because it looks perfect. 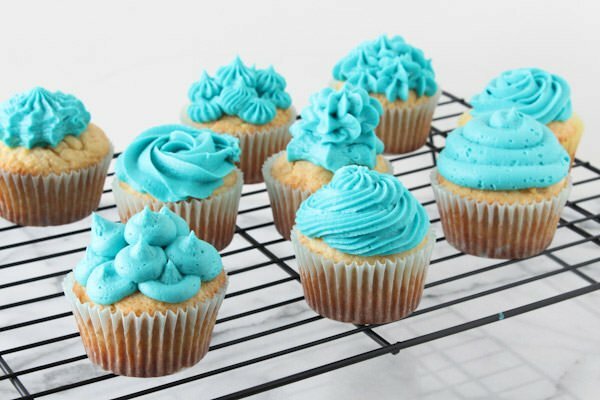 You have done a good job on making the cupcakes icing pretty. Just found you today via Pinterest and I’m so glad I did! Your video tutorials are very classy and well done. I plan on following you on your blog and YouTube regularly. Thank you for all the hard work you put into everything you do and for sharing it with us. I think your close up shots finally showed me what I’m doing wrong! When swirling I wasn’t “building” is the only word I can think of on the previous icing so it was looking flat and blah and unappetizing. I didn’t articulate that well but thank you! 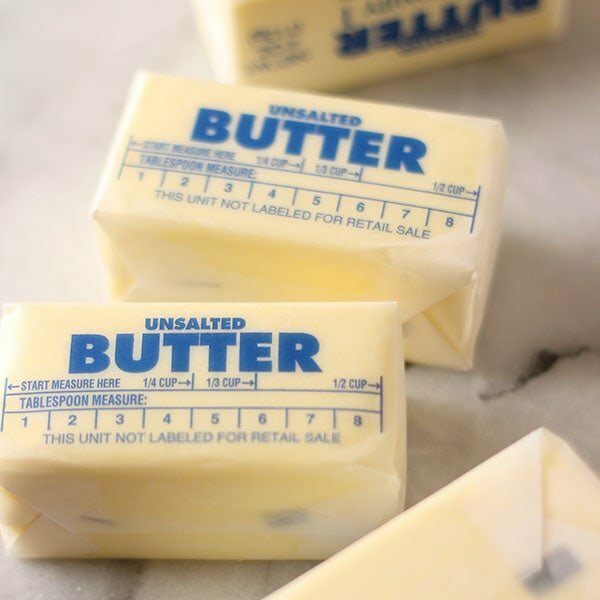 Hi, what is a store bought frosting that perhaps you can recommend? I don’t think I’ll have time b4 my event to make my own. I don’t particularly like store-bought frosting so I can’t say 🙁 However, I literally just whipped up a last minute batch of buttercream in 10 minutes! 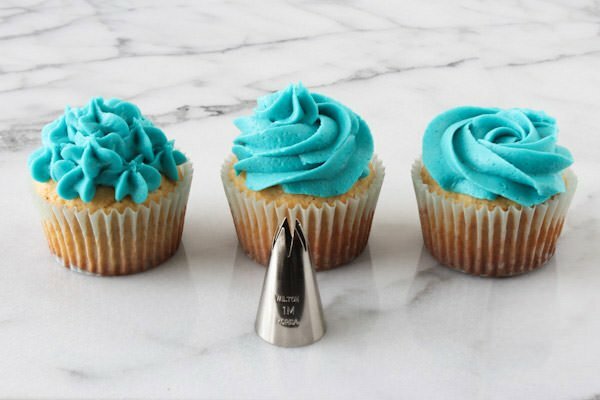 Hi, I am a home-based baker and have a question regarding the frosting. How thick is the icing before you begin to pipe it. Also, should it be cold or slightly cold? Sometimes, mine is too cold and I have to knead it to warm it up but then it doesn’t go on smooth, it looks like it has melted slightly. I just can’t get it the correct consistency. The thickness you need will depend on how you intend to pipe it. Any special flower or upright designs will require a stiffer consistency. Usually somewhere right in the middle is great for piping onto cupcakes, where the buttercream holds its shape but isn’t so thick that it’s difficult to pipe out. It should not be cold but instead at a cool room temperature. If it looked slightly melted try adding a few more tablespoons of powdered sugar to thicken it up, it might just be too thin in consistency. Thank you for sharing. Was referred to you by Heather Tullos @ Sugar Dish Me from one of her recipes. THANK U FOR UR VIDEO IT IS REALLY EASY N SIMPLE TO FOLLOW.. Thank you so much!!! Your videos are very helpful. 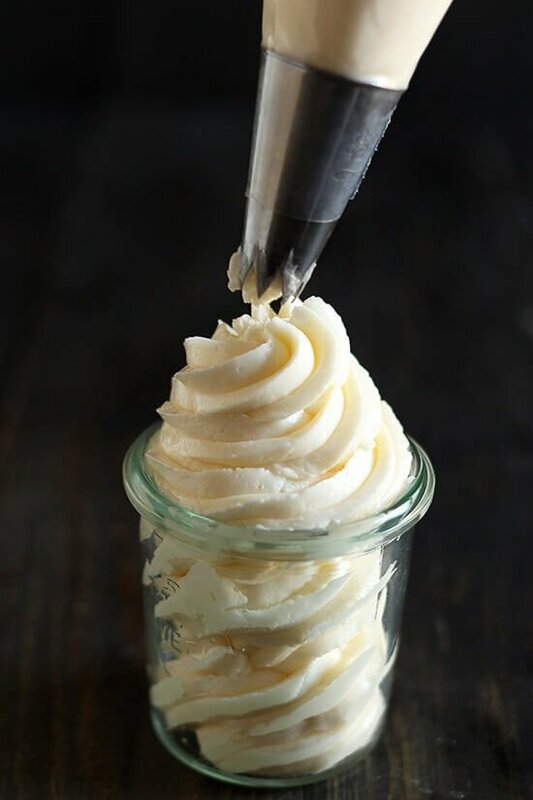 I never knew homemade butter cream could be so easy to make. I hate the taste of the store bought containers I usually get for decorating cupcakes when I bake. Thank you for your helpful instructions!